Envoy to the Promised Land: The Diaries and Papers of James G. McDonald, 1948-1951. Edited by Norman Goda, Richard Breitman, Barbara McDonald Stewart, and Severin Hochberg. Bloomington: Indiana University Press and U.S. Holocaust Museum, 2017. 1,048 pp. $60. On May 14, 1948, exactly eleven minutes after David Ben-Gurion proclaimed the establishment of the State of Israel, U.S. president Harry Truman announced U.S. recognition of the new state. The president was defying the firm advice of his State Department and its head, Secretary of State George Marshall, who contended the move was premature. At an earlier meeting, Marshall had told Truman that the rush to recognize was pure politics, and if it were done, he would not vote for the president in the November elections. Special U.S. representative James G. McDonald (left) meets with Israeli prime minister David Ben-Gurion, 1949. President Harry Truman selected McDonald as special envoy against the wishes of the State Department. Truman was not deterred. He had promised Zionist leader Chaim Weizmann that he would recognize the Jewish state without delay. The president was also outraged by the State Department, which in March 1948 had publicly humiliated him by reversing his support for partition and proposing to put Palestine under temporary U.N. trusteeship. Now, it was his turn to surprise the "striped-pants boys" (as he dismissively called State's bureaucrats). Truman quickly decided that it was essential that the United States have a special representative in Israel. With the State Department once again aghast, the president proceeded to select his own candidate, James G. McDonald. Why McDonald? The recent publication of McDonald's diaries and papers clarifies his, and Truman's, roles in the creation of Israel. McDonald was born in Coldwater, Ohio, in 1886. While his father was Scot, his mother was German, and he spoke the language fluently. Nominally a Catholic, his wife was Methodist, and neither were church-goers. He studied at Indiana University and completed an M.A. in history, political science, and international relations at Harvard. In 1933, he was appointed League of Nations High Commissioner for Refugees, and in this capacity, met with Hitler shortly after he became chancellor of Germany. McDonald was appalled to hear Hitler say: "I will do the thing that the rest of the world would like to do. It doesn't know how to get rid of the Jews. I will show them." He reported Hitler's remark to the newly-elected president Franklin Roosevelt, who was too busy trying to revive the American economy to give much thought to the Jewish plight. As the Nazi oppression of Germany's Jews began, and tens of thousands sought refuge in other countries, McDonald toured the world to find countries to provide haven for the fleeing masses. Not a single country was prepared to do so. In protest, McDonald resigned his League of Nations post in 1935. The account of his travails is recorded in his diary and papers for the period up to 1935 under the title Advocate for the Doomed,  the first of four books published by Indiana University Press. The second volume, Refugees and Rescue,  deals with his efforts before and during World War II to influence the State Department and President Roosevelt to adopt a more lenient policy and accept Jewish refugees into the United States. McDonald's efforts were largely futile. The State Department's visa division was headed by Breckinridge Long, a Roosevelt crony who had faithfully raised funds for the president's election campaigns. Long slammed the U.S. door shut, ostensibly to prevent spies entering the country, and Roosevelt endorsed this policy. Long recorded in his diary a message that he sent to all U.S. consuls in Europe: "We can postpone, postpone, and postpone," issuing visas for entry of refugees into the United States. In October 1940, a year into the war, McDonald and other critics met with the president in an attempt to pry the door open. When McDonald criticized Long, Roosevelt apparently told him not to "pull any sob stuff." McDonald was close to the president but not close enough to convince him to modify his policy on refugees. The two volumes reviewed here, To the Gates of Jerusalem and Envoy to the Promised Land, record McDonald's relationship with Truman and his work promoting the Zionist cause. The editors have done an outstanding job in sifting through the diaries and countless documents that McDonald preserved regarding his public service. 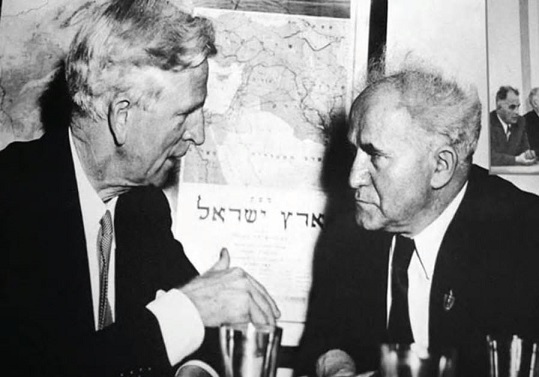 It was in 1946 that McDonald first came to Truman's notice in connection with the formation of the Anglo-American Committee of Inquiry on Palestine. Shortly after the war, in August 1945, Truman had called upon the British to admit 100,000 Jewish Holocaust survivors into Palestine. This led to the creation of the committee to be composed of six British appointees and six Americans. McDonald's experience with refugees in the 1930s was a key factor in his appointment. He was also well known to several prominent Jews who worked vigorously for his inclusion on the U.S. list. Among those was David Niles, Truman's right-hand man, one of two presidential advisers kept over from the Roosevelt administration. His closeness to Truman was a crucial factor in resolving differences that arose in the president's relations with leading Zionists. Israeli prime minister David Ben-Gurion (right), with Israeli ambassador to the United States Abba Eban (center), presents a gift to U.S. president Harry Truman. Truman recognized the Jewish state minutes after Israel was established, May 14, 1948. Two episodes reveal the crucial role McDonald fulfilled helping Truman avoid pitfalls that might have undermined his stand as a firm supporter of Jewish statehood, and once the state was created, in ensuring that Washington did nothing that would compromise its independence. The first critical issue related to the Morrison-Grady Plan for autonomous Jewish and Arab provinces under British sovereignty. McDonald's campaign in opposition to that plan is charted in To the Gates of Jerusalem. The second episode, described in Envoy to the Promised Land, was his fight against the Bernadotte Plan, which demanded, among other things, that Israel give up the Negev in contravention of the November 1947 partition resolution. In the first case, it was McDonald's direct intervention that saved the future Israeli state from emerging as a tiny canton under British tutelage, and in the second, after Israel's establishment, from having the Negev detached from its territory. Both schemes originated in the British Foreign Office and received State Department blessing. admission of 100,000 Jewish refugees into Palestine. The second was to ensure that whatever recommendations the committee might adopt would reflect the unanimous agreement of all its members, both British and American. Foreign Minister Ernest Bevin had promised committee members that he would do everything he could to implement a unanimous report. Anything less than unanimity, McDonald felt, would provide an avenue to avoid its proposals by reference to a minority opinion. McDonald achieved both goals. The report was composed of ten major recommendations, at the heart of which was the urgency of admitting the refugees to Palestine. McDonald also realized that many of the British delegates were incensed at the Jewish Agency, which they felt acted in unison with the Jewish underground to undermine British authority in Palestine. It was a difficult task to ensure that the report contained no condemnation of the agency or demands for disarmament of the Hagana. But due to McDonald's efforts, the report, which had to be handed in only four months after the committee's formation, by the end of April 1946, omitted reference to both problems. The report shocked Bevin and Prime Minister Atlee, who claimed that it was unworkable and would bring immediate fighting between Arabs and Jews. They insisted that implementation of any part of the report be gradual, most particularly that admission of the 100,000 refuges commence after a series of steps to normalize the situation, including disarming the Hagana. They proposed that a small joint committee meet in London to iron out the procedures. Truman, expecting this was designed to expedite entry of the 100,000, agreed and appointed the State Department's Henry Grady to meet with Herbert Morrison, the British representative. This led to the Grady-Morrison Plan that proposed semi-autonomous Jewish and Arab cantons under a central trusteeship government run by the British. If both Jews and Arabs agreed, then the refugees could begin to arrive. The entire plan was a pipedream; neither Jews nor the Arabs were prepared to accept it. Nonetheless, at the urging of the State Department, Truman was inclined to go along, hoping this would finally lead to implementation of the scheme for the 100,000. It was here that McDonald proved his mettle. Linking the 100,000 to Arab acquiescence in a cantonal settlement meant admission would be permanently postponed. This would be a repudiation of the president's wish. On July 25, McDonald met with Secretary of the Treasury John Snyder, who arranged for him, together with senators Robert F. Wagner and James M. Mead of New York, to meet with Truman two days later. McDonald engaged in a vigorous debate with Truman about how Grady had been sold a bill of goods in London that would so adversely affect the president's name that "he will go down as anathema. He [the president] exploded at this point." McDonald said he, like Truman, was from the Midwest, and he "had no object in coming except to tell the truth." To this Truman replied, "I want to hear it. I hear it too seldom." The two senators later said that "they had never seen as frank a statement by a non-politician to the president." Truman became convinced and ordered the Grady team to return to Washington. He even sent a letter to McDonald expressing his appreciation and added: "I hope [the White House meeting] wasn't too hard on you." McDonald's intervention was clearly the decisive factor that brought the president around to ditching the entire Morrison-Grady scheme. In the face of Washington's withdrawal from the British proposal, Bevin turned to the United Nations to resolve the Palestine problem. The U.N. set up a Special Committee on Palestine (UNSCOP) that recommended partition, and the General Assembly voted in favor by a two-thirds majority on November 29, 1947. The resolution called for the creation of both an Arab state and a Jewish state upon the withdrawal of the British from the Mandate. Accordingly, the Jewish state emerged on May 14. The next day, five Arab armies invaded the territory of the Jewish state, locking Israel in a life-and-death struggle. As noted, in the summer of 1948, Truman decided that the United States needed a representative in Israel to keep the White House informed of developments. Truman had been impressed with McDonald's forthrightness in guiding him away from a debacle over Morrison-Grady and moved to appoint him, over the State Department's vociferous objections. They insisted recognition had only been de facto, not de jure, and at least until armistice agreements were secured, a diplomatic representative was out of place. Moreover, these officials felt the president's choice was particularly injudicious. Undersecretary of State Robert Lovett charged that McDonald "was recognized as a proponent of the Zionist cause," and his appointment could adversely affect the present truce. Truman ignored the opposition and made the appointment. In a meeting with McDonald before his departure, the president "stressed his desire to have his own means of communication and of information to and from the State of Israel." This was a sad reflection on Truman's confidence in his Department of State. On May 29, 1948, the U.N. Security Council adopted a resolution imposing a four-week ceasefire in the Arab-Israeli war and appointing Count Folke Bernadotte of the Swedish Red Cross to serve as a peace mediator. After extricating Britain from the Palestinian morass, Foreign Minister Bevin now decided it was essential that it gain control of the Negev to serve as a base to protect the Suez Canal. At the beginning of the Cold War, British-U.S. defense plans focused on the Middle East, not only to protect its oil resources but also as a vital launch pad for long distance bombers against the Soviet Union in the event of an actual conflict. Throughout 1948, Bevin kept pounding Washington with messages on the critical role slated for the Negev in British-U.S. strategy, and Bernadotte was glad to cooperate in implementing the British-U.S. scheme. Early in September, British and U.S. officials met secretly with Bernadotte in Rhodes and were pleased that his proposal paralleled the views of their two governments. The essence of the plan, announced officially on September 16, was that the Negev should be detached from Israel and transferred to Transjordan. Initially, Bernadotte also called for Jerusalem to come under Transjordanian authority but later proposed that the city be internationalized. On September 21, U.S. secretary of state Marshall announced that Washington endorsed the plan "as the best possible basis for bringing peace to a distracted land." Israel was furious, as was Truman. The Democratic Party platform adopted in the summer had declared categorically that Israel's borders shall not be modified without its consent, and the president had confirmed this stand. Truman was so horrified that he personally drafted a message to Marshall declaring that his statement "requires clarification ... I shall have to state that my position as to boundaries has not changed." No one outside the White House knew of this crisis. Truman was dissuaded from sending the telegram since the effect would have been disastrous for his election campaign: The president and secretary of state would be revealed as engaged in a public squabble, possibly leading the latter to resign on the eve of the elections. With the president silenced, the State Department continued to promote the plan. Israeli soldiers in Beersheba, Negev, 1948. U.N. appointed mediator Folke Bernadotte proposed that the Negev be detached from Israel. In response, Jerusalem launched Operation Yoav, sweeping Egyptian forces out of the Negev and shutting the door on this British-U.S.-hatched scheme. Clearly, Israel was not about to surrender the Negev, about half its overall territory, at the behest of the U.N. mediator. How then did Bevin think he could compel Israel to withdraw? His plan was to invoke the force of a Security Council resolution. Fighting with the invading Arab states had been constant from the day of Israel's birth, disrupted only by several U.N. ceasefires, to which Israel objected. The ceasefires, Israel contended, simply enabled the Arab states to avoid coming to terms with the reality of the Jewish state. Egypt controlled the road from Majdal to Beit Jibrin, cutting off twenty-five Israeli villages in the northern Negev. Given this situation, and in light of Bernadotte's proposal for the Negev to be detached from Israel, the government decided to launch Operation Yoav. On October 15, Israeli forces swept most of the Egyptian forces out of the Negev, leaving only four thousand Egyptian troops surrounded in the Faluja pocket. Israel had effectively shut the door on the British-U.S. scheme for the Negev. Draft Security Council resolutions from the two Western allies called for immediate withdrawal of Israeli forces to the October 14 lines, the envisioned boundary of the supposed detached Negev. Bevin demanded that the draft resolution include a threat that failure of any party to withdraw to those lines would subject the violator to U.N. sanctions, a deadly prospect for the nascent Jewish state. subject of sanctions on November 3, resulting in modifications to the Security Council draft resolution adopted the next day. The threat of sanctions was eliminated. Instead, any failure of a party to withdraw its forces to the October 14 line would be reported by the acting mediator to the Security Council, which would then consider what measures under chapter VII of the U.N. charter would be appropriate. The crisis was averted and the British scheme was checked. Israel's hold on the Negev was never again to be challenged. Truman's victory in the presidential contest sealed the issue of the Negev. The publication of McDonald's diaries makes his major role in the formation of U.S. policy at this critical juncture fully visible at last. The cover of volume 3 of the McDonald diaries contains the following sentence: "It is entirely possible that [the birth of the modern state of Israel] would not have come about were it not for the determined efforts of James G. McDonald." While this is possibly an overstatement, few non-Israeli individuals had as great a share in the creation of the Jewish state as did James G. McDonald. Shlomo Slonim is the James G. McDonald Professor of American History, Emeritus, at the Hebrew University of Jerusalem. Advocate for the Doomed: The Diaries and Papers of James G. McDonald, 1932-1935, Richard Breitman, Barbara McDonald Stewart, and Severin Hochberg, eds. (Bloomington: Indiana University Press, 2007). Refugees and Rescue: The Diaries and Papers of James G. McDonald, 1935-1945, Richard Breitman, Barbara McDonald Stewart, and Severin Hochberg, eds. (Bloomington: Indiana University Press, 2009). Resolution 181 (II). Future government of Palestine, Nov. 29, 1947 , U.N. General Assembly. Foreign Relations of the United States (FRUS), 1948, The Near East, South Asia, and Africa, 1948, part 2, vol. V, pp. 1398,1365. FRUS, 1948, The Near East, South Asia, and Africa, vol. V, part 2, p. 1415. "Memorandum of Telephone Conversation, by the Acting Secretary of State," ibid., p. 1430, ftnt. 2. McDonald, Envoy to the Promised Land, vol. 4, pp. 219, 221. FRUS, 1948, The Near East, South Asia, and Africa, vol. V, part 2, p. 1541. McDonald, Envoy to the Promised Land, vol. 4, p. 221. Ibid., p. 222, ftnt. 24. President Truman to the President of the Provisional Government of Israel (Weizmann), FRUS, 1948, The Near East, South Asia, and Africa, vol. V, part 2, Nov. 29, 1948.